HOPKINTON — As the sun began to rise and illuminate a darkened sky, the Boston Marathon athletes village at Hopkinton High School was eerily quiet — a true calm before the storm of thousands of runners arriving. Machinery transported food and water to the stations under the tent while volunteers traveled around in golf carts and security patrolled the area. And as the first bus pulled up to the entrance, 23-year old Shihan Wijeyeratne stepped down and became the first runner to arrive for the 121st running of one of the world’s oldest and most famous footraces. 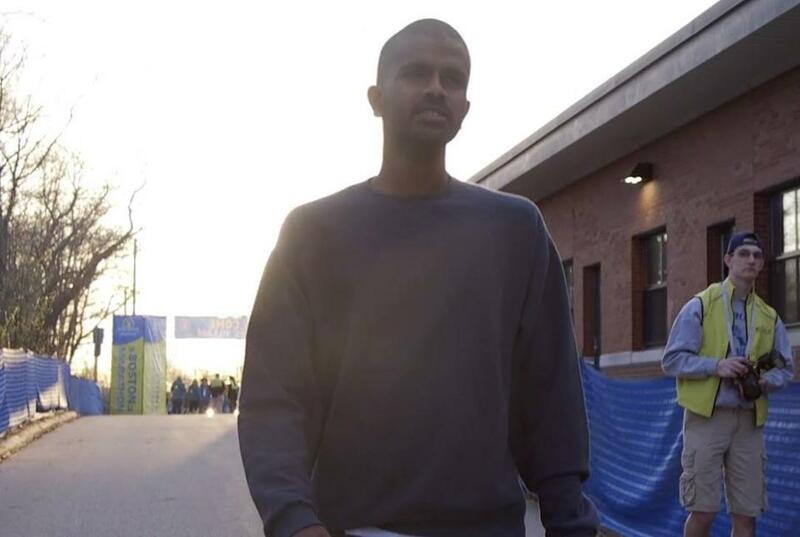 Wijeyeratne is from Richmond, Va., and even if he didn’t plan on being the very first person to arrive Monday morning, he certainly didn’t want to be one of the last. “I didn’t want to be rushed and I didn’t want to be thrust in here with the crowd of thousands of other people, so I figured getting here early was the way to go,” said Wijeyeratne. This was the first time Wijeyeratne ran Boston. A torn meniscus in his knee kept him from making it to the starting line when he was registered to run in 2014. An experienced marathoner, Wijeyeratne has competed in five marathons, including New York and Philadelphia. But he said nothing compares to the 26 miles from Hopkinton to Boston. Wijeyeratne was aiming for a time of 2 hours, 37 minutes, 18 seconds — which comes out to a 6-minute-mile pace. But he fell short of his goal, finishing in 2:54:19. As Wijeyeratne entered the athletes village, he slowly turned his head from side to side, taking in all of his surroundings. He arrived at a station and grabbed a cup of coffee and bagel and walked over to pick up a bottle of water. Wijeyeratne then made his way toward the open field, out in the sun that was now beginning to make its grand entrance. Music began to play and instructions blared over an intercom as runners slowly wandered in. But an eerie, empty feeling still existed, even with tens of thousands of runners yet to come. Wijeyeratne marked out his spot, stopped in the middle of the grass, took a sip of his coffee and a deep breath, and then remembered right there he had forgotten to bring a blanket upon which to sit. Apparently you can’t remember everything at 6:30 in the morning.